Sealants are designed to protect the finish of the car from dirt, moisture, UV rays, industrial fallout and more. They have been on the market for a while now, but many have been a bit quirky in their application or have had long cure times before you could enjoy the benefits of the product. Opti-Seal is a true paint sealant with no cleaning properties. It provides a crystal clear polymer barrier between the finish and the harsh elements, and best of all it easily goes on in minutes. Once completed, you will be left with a beautiful finish that will provide months of protection. Since it has no fillers, it is best to polish the surface first to remove imperfections to achieve maximum gloss. Afterwards you can enhance and protect the finish with a coat (or two) of Opti-Seal’s polymer sealant. Even if the finish hasn’t been freshly polished, you can still enjoy the benefits of Opti-Seal. Just be sure to apply it on a surface that has been thoroughly cleaned. Opti-Seal is hyper-concentrated, so a little bit goes a long way! Just one ounce will seal and protect 4 to 5 cars. It comes with an 8 oz. bottle and a foam applicator pad. A nice added benefit of this product is that it will protect more than just the painted surfaces. You can use it on plastic trim (won’t stain), on your rims, metal trim, and of course on your paint. It’s truly a versatile product! I use it on my customers’ cars, and I use it on my personal cars. Then spray a fine mist directly onto the surface. I will generally use no more than 2 sprays for an entire door. Remember, a little bit goes a long way! Now take your foam pad and gently wipe the surface to spread it evenly. You’re not using pressure here; you’re simply spreading it around to get an even coating. Don’t forget to apply it to your door jambs, rims, and trim pieces too. Although Opti-Seal is a wipe on and walk away product, you may find some slight streaks or haze in spots once it evaporates. This just means that it was applied too heavily in spots. You’ll particularly pick this out on darker colored vehicles. I like to let the product cure for about 20 minutes, and then inspect for hazing or streaks. If I find any, I will lightly spray some Optimum Instant Detailer and Gloss Enhancer directly onto a plush microfiber towel, and then very gently buff the residue off of the surface to reveal a beautiful finish. It’s as simple as that! Here’s a photo of the Z06 Corvette once I was finished. It was first polished with Menzerna 106FA and PO85RD, and then I applied 2 coats of Optimum Opti-Seal. Stunning! Great write-up for an equally great product. I’ve been using Opti-Seal for about 2 years now and have never sprayed it directly on the paint surface. I’m going to give that a try. Thanks Justin! Since you’ve been using it for so long, I think it’s safe to say that you’ve found it to be a great product as well. I know Wet Diamond you need to allow for it to sit 8 hours before applying wax. How long do you have to wait for wax if you use opti seal? Do you prefer a sealant over another? Thanks! After about 20-30 minutes, Opti-Seal is ready to go. The only wax I usually use with Opti-Seal is Optimum Car Wax. Instead of wiping down the Opti-Seal residue with quick detailer, I’ll use the Optimum Car Wax if desired. To use my time efficiently I will apply Opti-Seal, then during the 20 minutes or so that it’s curing I will use that time to finish wheels, wheel wells, exhaust tips, windows, or any other quick processes so I’m not just “waiting” for the sealant to cure. I like both Opti-Seal and Blackfire Wet Diamond very much. Usually I’ll grab the Opti-Seal if I’m short on time because the application is quicker. If I have more time available, I’ll typically use Blackfire Wet Diamond. Thanks for testing the products and posting the results. Can I use Opti Seal with Menzerna Power Finish? And how often can I apply Opti Seal to my ride. As with any polish, just make sure that you’ve thoroughly removed all of the polish oils and residue prior to using your sealant. This will ensure you’re getting the best bond with the finish. After polishing with Power Finish, either re-wash the car, wipe it down with isopropyl alcohol, or use a product like Chemical Guys Vertua Bond 408 to prep the surface and get it ready for your sealant. You can apply Opti Seal as often as you like, but since it’s a very durable sealant, there’s not much need to do it more than every couple of months or so (even though it will last 4-6 months). Thanks much for your prompt reply. You mention “wipe it down with isopropyl alcohol”. How do I go about it? Do I need special tools to do it? and is it safe? Just pick up a bottle of isopropyl alcohol and some distilled water from your local grocery store. Mix it 50/50 in a spray bottle. Then spray it directly onto the surface and wipe it down with your soft, clean microfiber towel. Do this one panel at a time…it only takes a few minutes to do the whole car. It’s completely safe. Great write up, had 2 questions. I just finish polishing my car with Menzerna Power finish as my 1st step then Menzerna Super Finish, do I have to wash the car again or can I just wipe it down then apply my opti-seal? Thank you and keep the writes up coming great stuff. You should either wash the car after polishing, or you can do a wipedown with Isopropyl Alcohol afterwards before applying the Opti-Seal. 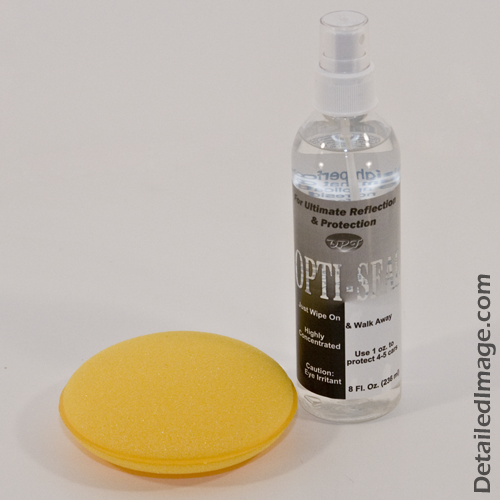 This will remove any polishing oils and will help the durability of the sealant. Great review. From your experience, if I apply Opti-Seal after I’ve applied other sealant on the paint, Opti-Seal will damage the previous sealant? I’ve never layered Opti-Seal over anything else, so I don’t know the exact answer to your question. I’m not a fan of layering sealants of different brands, because there may be issues with bonding of the one on top of the other. And if one sealant provides 4 months of protection, and the other provides 6 months of protection…layering them will not yield 10 months of protection! If you want to put down multiple layers, I would recommend doing it with the same brand. Hi Todd, I was so impressed with your car and the review, I bought my first bottle of Opti-seal. I just recently had a restoral detail done on my car. The clear coat has no swirls now and is virtually scratch free, but I want to maintain the beautiful finish. Since the Bar claying, polishing and waxing was done. Since your car has just been fully detailed with paint correction, you’re just about ready to use your Opti-Seal. Just give it a good, thorough wash and you may want to use a strong solution to help strip whatever kind of wax or sealant that the detailer may have used. Avoid the shammy, and get yourself some high quality waffle weave microfiber drying towels. Only do the alcohol wipedown if you feel that the wax or sealant hasn’t been completely removed during the wash process. Now you’re ready to apply your Opti-Seal according to the directions and you’ll be good to go! Is this good on windows too or would you recommend something else? Yes…it does work great on glass. That black ZO6 is incredible! Is that shine from the Opti-Seal only or did you apply a wax? That Z06 was also highly polished prior to application, and that’s where the majority of gloss will come from. The only product applied afterwards was the Opti-Seal. Thanks for the great review. My car is about 1 month old and I’m thinking I should wash, clay, and seal before it gets any imperfections. That way I can maintain with just regularly washing and occasional re-application of sealant. Do you think this logic is correct? Also, I’m debating over Blackfire Wet Diamond and Optimum Opti-Seal. I’m on a college student budget, but don’t mind paying a little extra if it means higher quality and longer lasting products. The BFWD and Opti-Seal are very close in price, but I was wondering if you would recommend one over another? Maybe the product better suited for someone who is looking for protection/durability and not show car looks? Is one longer lasting, easier to maintain, can handle repeated washes, etc..? Thank you in advance and sorry for so many questions. That’s a good idea, and I highly recommend that new cars get prepped properly. For more information on that subject, please refer to my New Car Prep article. Thanks for the reply Todd. I’ll make sure to read your article. I’ll be applying by hand so my guess would be that Opti-seal would be easier to use. Would you happen to know if there is a big difference in the number of applications per bottle of each respective product? I know from my own reading that Opti-seal can seal about 4-5 cars with 1 oz., but dont know how much a 16 oz. bottle of BFWD would get. Thanks Todd, I really appreciate your help. Hey Todd, incredible work and awesome review! I plan on applying Opti-Seal to my Lexus SC300 after polishing and was wondering if you have any experience with Swissvax waxes. I ask because I have a tub of Swissvax Reflexus wax and was planning on topping the Opti-Seal with this. Unfortunately I do not have experience with them and can’t say how it might react with the Opti-Seal. Rarely will I top Opti-Seal with any wax, and when I do it’s usually Optimum Spray Wax. Todd…can you give me some comments on using opti-seal on the black stripes on my new Dodge Challenger? I have used it over black stripes on other cars without any issues at all. If there’s any inconspicuous parts of the stripes on your car where you can do a small test spot, that would be advisable. I’m sure it will be just fine, but there’s no way I can know how it will react on every car. I think I see a clear bra line in that corvette photo. I’m curious to know how the Opti-Seal effects the film. I have Ventureshield on my car and other than a generic soap/water recommendation from the dealer that sold it to me I don’t have a clue how to clean and maintain it. The web is full contradicting recommendations. Any suggestions would be much appreciated. Thanks! Is this the same as Zaino Clear Seal? Curious if Opti-Seal can be put on top of the Blacklight which you also like so much. Since that product seems to be a bit of a hybrid all in one, I’m guessing probably not??? but maybe on top of Creme Glaze?? Can i put Opti-seal on a HD Roadking windsheild? How about more motorcycle details/advice articles. I guess they don’t answer questions anymore. Hey Guys – the authors of some of these older articles are no longer contributing to the blog. You can always direct your detailing questions to Detailed Image customer service. https://www.detailedimage.com/Contact/ I have no experience with Opti-Seal, otherwise I would be happy to help answer some of these questions. They informed me that without protection the oxidation would re occur and next year I may need to re-polish the lens once again. Upon arriving home I applied “OptiSeal” as a temp fix until my order of “Optimum Opti-Lens” arrived. Now that “Optimum Opti-Lens” has arrived how do I remove the “OptiSeal” from the lens so as to apply the Optimum Opti-Lens.